Today I start with just one question, will we ever be over glitter? I, for one, would never be over anything thats shinny and sparkly and refelects, I mean how can one possibly ignore how beautiful such things look! When it comes to makeup, glitter on eyes is pretty classic. No matter what skill level you have, a dab of glitter on eyes can just pull everything together so beautifully can even you can't believe you did it. While we are at it, I was so upset because the stilla magnificent metals were so darn expensive and to be honest I just can't get things like those which I will be wearing once or twice a year, that too if I am invited to a wedding party or something. Anyhow, on my search to find a cheaper dupe for the famous liquid glitter shadows, I came across the Heng Fang Glitter Eyeshadows and I just knew I had to get them. Today we are going to talk about them. The Heng Fang Liquid Glitter Eyeshadows come in a clear plastic bottle with a rose gold screw top that has a flat applicator at it end. The packaging looks beautiful and not cheap at all and the applicator is really good at dispensing the product. 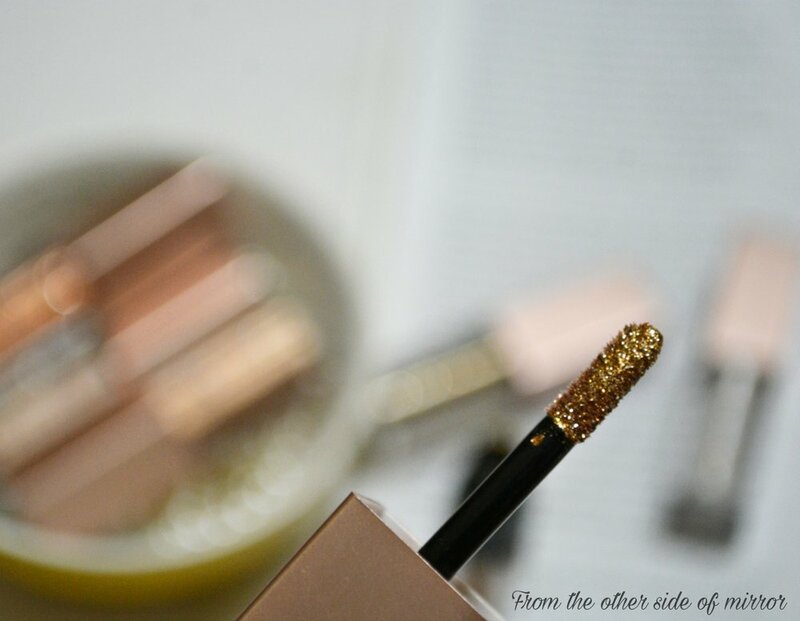 However, I would say that you take the product kn you fingers and work it on your eyes, because there is too much product on the wand that applies heavily on the eyes and doesn't dry for a long time. The packaging is super cute, classy and travel friendly for sure. The cap secures nicely and there is no chance of spillage. Coming to the product itself, the consistency varies from shade to shade. The silver and gold one swatch patchy and do not hold much pigment to them, so they would work well as Eyeshadow toppers. While the rose gold and copper ones have a very thick consistency, Swatch seamlessly and hold alot of pigment. So if you are doing a cut crease, you can even skip the base colour with these two. Since I have sensitive eyes and they water up even at the sight of something irritable, I am very happy to say these glitters didn't irritate my eyes at all. However, when you apply them, at first you might feel a cooling effect on your lids, that's because the liquid is drying up to set. For that I recommend taking it at the back of your hand and then dab it layer by layer on your lids. A fine layer would dry quickly and won't irritate your eyes at all. One thing you need to take care about is to not open your eye while the glitter is drying as it will cause creasing and bunching up of the product in your crease and trust me that doesn't look pretty at all. So do one eye at a time, apply in thin layers and let it dry completely before layering or opening your eyes. Once dry, these glitters are there to stay for a very long time. Even if you rub your eyes, these aren't coming off easy! These stay beautifully put for a good 5-6 hours after which they start to fade slowly. One of the best things about these glitters is the mess free application, with no fall out and no need of an extra step of having a sealer applied before. Its more like just dab and and go, you know what I mean right? Now the question is, are these really dupes for Stilla Magnificent Metals? In all honesty, I don't know as I don't own the later but looking at the pictures online, the Stilla ones are more intense with a strong metallic base in which glitter is suuspended while the Heng Fang one's are relatively sheer as compared to them. I would say these look more like Pixi Beauty Glitter toppers in consistency and pigmentation. All in all, I would say that these are amazing glitter shadows that give you a fuss free application and last long time enough to get you through the night. If you are looking for a cheaper alternative to the Stilla one's, you should definitely consider getting these! The Heng Fang Shimmer Metal Glitter Eyeshadow is available at Ali Express where the price varies from seller to seller. You can get individuals for 1.30 $ and up. The set of 6 retails for about 10$ which I think is pretty great. I got these from an online seller for PKR 1600/-. You can find these at different Facebook resellers online. ARE YOU A FAN OF THE GLITTER SHADOW TREND? WOULD YOU INVEST IN AN EXPENSIVE PRODUCT THAT YOU WOULD RARELY USE OR FIND ITS CHEAPER ALTERNATIVE? LET ME KNOW IN THE COMMENTS SECTION BELOW.